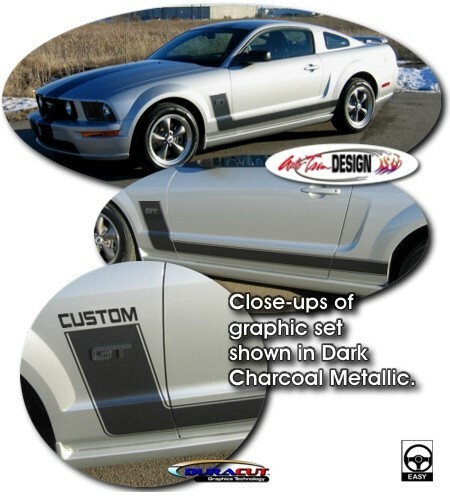 Hit the street with this awesome body side graphic kit for your '05-'14 Ford Mustang. This retro "Hockey Stick" style graphic is very easy to install and features a .2" (5.08mm) pinstripe at each side as shown. Available in a wide variety of colors and is packaged with one (1) graphic for each side of the vehicle. You can even select Custom Wording to be placed above the front area as shown. Simply enter the Custom Wording of your choice (up to seven  letters/digits/spaces) and we'll make it happen! 'Click' here to review Custom Wording not allowed for use. While graphic is specifically set for the '05-'14 Ford Mustang V6 or GT, it can be used on just about any Mustang with a little trimming. Installation of the graphic set is very easy and only requires trimming at the door jambs and at the rear wheel well. For GT and Pony models, careful removal and reinstallation of the decorative fender emblem is required.